Windmill Animal Hospital - In the News! Windmill Animal Hospital, Abilene's premier veterinary facility, is in the news! Thursday, June 19, 2014 - KTAB - Channel 32, Abilene .Dr.Price talks with KTAB 4U host Bethany Beyer, about Keeping your pets safe in the heat. Summer is here. Here are some great tips to keep your pets safe from Heat Stroke. Too many pets are lost to heat stroke each year. With some common sense and a little preaparation, you can keep your pets safe from this killer! Thursday, May 8, 2014 - KTAB - Channel 32, Abilene .Dr.Price talks with KTAB 4U host Dayne Marae, about Canine Heartworm Disease. Dogs in Big Country need heartworm Prevention. Dr. Price discusses the symptoms for canine Heartworm disease, and how easy and inexpensive it is to prevent, compared to treatment. Thursday, March 27, 2014 - KTAB - Channel 32, Abilene .Dr.Price talks with KTAB 4U host Dayne Marae, about Rattlesnake Vaccine. Rattlesnake strikes on dogs usually involve their head/neck or front feet. Unvaccinated dogs struck on the head or face can swell so severely that they suffocate before ever getting to the veterinary hospital for treatment. Those unvaccinated dogs fortunate enough to survive the initial snake strike can slough, or lose, huge areas of skin, leaving gaping wounds requiring months of hydrotherapy and additional surgeries to close. On the other hand, vaccinated dogs generally have dramatically reduced mortality, swelling, hospitalization time, and skin slough; it is commonly unnecessary to use antivenin with vaccinated dogs. Rattlesnake vaccinations have got to have one of the best returns on investment of any preventative care known to veterinary medicine! Ask your Abilene Vet about Rattlesnake vaccine for you dog! Thursday, February 13, 2014 - KTAB - Channel 32, Abilene .Dr.Price talks with KTAB 4U host Juanita Adame, about the importance of proper dental care for your pets. By 3 years of age, 85% of our pets have periodontal disease. How do you tell if your pet has periodontal disease? It's easy--does your pet have bad breath? If you flip your pet's lip up and look at his teeth, can you see unsightly tartar? inflamed/bleeding gums? Does your pet resist his muzzle being handles, due to pain? Is your pet no longer playing with his toys? Thursday, January 23, 2014 - KTAB - Channel 32, Abilene Now that you have a new puppy, how do you make him an outstanding canine citizen? Dr. Price talks about training, socialization and veterinary care of your new puppy. Great advice for any new pet! With KTAB 4U guest host Brittany Pelletz. Wednesday, January 8, 2014 - www.AngiesList.com Windmill Animal Hospital has earned the Angie's List 2013 Super Service Award! Thank you to the clients that have taken the time to review us on Angie's List! Windy, the Olympic Ski Jumper, injures himself while training...The Ski Patrol takes him to the Windmill where he is examined, Digitally X-Rayed, undergoes Laser Surgery, then receives Therapeutic Laser treatments...then back to the Winter Olympics where he wins the Gold Bone, cheered on by the Windmill Staff chanting "USA USA!"! First aired December 23, 2013. Have you ever wondered how the Windmill Team keeps our hospital smelling so good? Our hidden cameras discover the secret after "Maverick" makes a mistake in the lobby! The "Poop Patrol" has the mistake cleaned up in the blink of an eye, and Dale Robertson walks in to confirm that the Windmill "Smells Good Too!". Thursday, December 12, 2013 - KTAB 4U - Channel 32, Abilene Dr. Price, an Abilene Vet, discusses how to select a puppy for Christmas....it is also great information for picking a puppy at anytime of the year. With Juanita Adame of KTAB 4 U.
Wednesday, December 4, 2013 - KTAB News - Channel 32, Abilene Dr. Price talks about the importance of preparation for Cold Weather for your pets to stay safe and warm. Keep them warm, keep them dry , keep them in the garage or inside! With LaDyrian Cole of KTAB news. 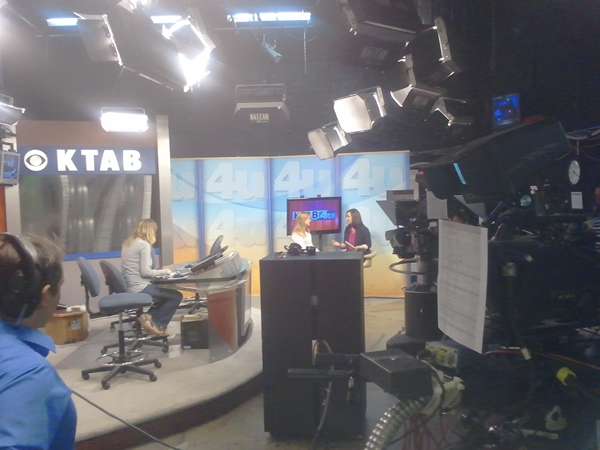 Thursday, November 21, 2013 - KTAB 4U - Channel 32, Abilene Dr. Price, an Abilene Vet, talks with KTAB 4 U host Juanita Adame about keeping your pets safe during the Thanksgiving and Christmas holidays. Thursday, October 24, 2013 - KTAB 4U - Channel 32, Abilene Dr. Price gives some great tips on keeping your pets safe during Halloween. Halloween is the start of some very dangerous times for your pet...from escaping out the door with so many holiday visitors, to eating chocolate (which is poison to a dog), to getting a digestive tract obstruction with candy wrappers of costume parts. With KTAB 4 U host Juanita Adame. Thursday, October 24, 2013 - KTXS News - Channel 12, Abilene Dr. Price gives some great advice on keeping your pets safe during Halloween. With Chelsea Humphrey of KTXS 12 news. Monday, October 21, 2013 - KTXS News - Channel 12, Abilene Dr. Price talks with KTXS Reporter Chelsea Humphrey about successfully treating and managing Pet Allergies. Pet Allergies are the number 1 reason for visiting the vet. Managing your pet's allergies will drastically improve both your pet's and your own quality of life! 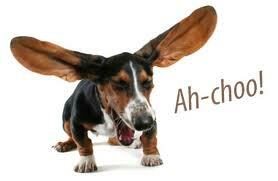 Windmill Animal Hospital has a very effective, organized approach to helping your pet's allergies! Monday, September 16, 2013 - La Voz 93.33 FM . Windmill Animal Hospital celbrates its Second Birthday! Windill was surprised by birthday wishes offered by the hosts of the "Pete and Jalapeno Show" on La Voz 93.3 FM here in Abilene. Take a listen! Thursday, August 23, 2013 - KTAB - Channel 32, Abilene . Dr. Price talks with KTAB-4U host Matthew Torres about the importance of spaying and neutering your pets! This practice protects the health of your pet, solves several behavior problems, and helps with our high levels of homeless pets here in Abilene. Thursday, July 25, 2013 - KTAB - Channel 32, Abilene . Dr. Price talks with KTAB-4U host Matthew Torres about MANAGING your pet's allergies, rather than just giving the harmful "steroid shot". Wednesday, July 3, 2013 - KTAB - Channel 32, Abilene . Dr. Price talks with KTAB-4U host Matthew Torres about keeping your pet safe during July 4th festivities. - Bar-B-Q is PEOPLE food, NOT Pet food! 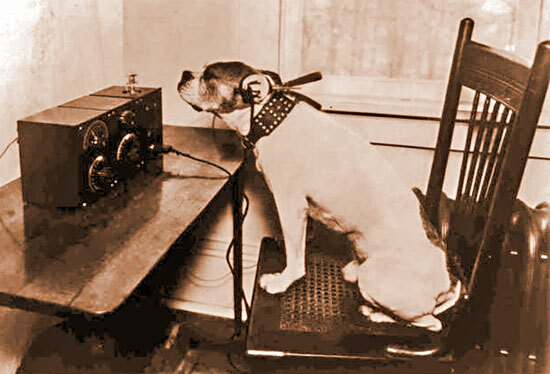 Fireworks are very loud and can be frightening to your pet with sensitive ears....great safety tips! Thursday, June 27, 2013 - Duda Mobile Blog. Dale Price (Dr. Price's husband) is interviewed about the mobile website (m.WindmillVet.com). Click here to read the article. Thursday, May 23, 2013 - KTAB - Channel 32, Abilene . Dr. Price talks with KTAB-4U host Matthew Torres about keeping you pet cool during the summer and avoiding heat stroke for your pets. One of the cool things you can do is make Backyard Pet Ice Cakes! Frozen water with veggies, healthy treats, and chew toys inside! A Fun and Easy way to keep your dog cool! Did you hear the one about a man and a dog in a bar? One Windmill client says he likes the Windmill because It Smells Good Too, but a Windmill patient says he likes Windmill because he gets the Best Pet Care Anywhere...and the argument is on! Great Care - Smells Good! First aired May 7, 2013. Thursday, April 25, 2013 - KTAB - Channel 32, Abilene . Dr. Price talks about Heartworm Disease - both prevention and treatment (prevention is a whole lot easier on the dog and the pocketbook!). With Matt Torres on the live television show KTAB 4 U! Click here for more information about the TREATMENT for heartworms (easier to prevent heartworms in the first place!). Saturday, March 23, 2013 - Duda Mobile Websites - Windmill Animal Hospital's mobile website was just awarded "Mobile Website of the Week". Our mobile website features one click to Text Us, Email Us, Get Directions, or Call us! Plus it has the entire 400+ page website behind it to entertain and educate you when you are just surfing. 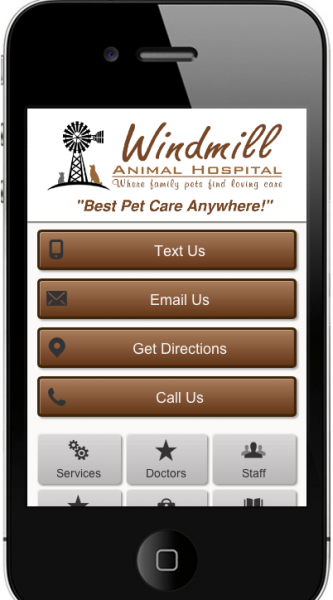 If you are on a smartphone, just go to www.WindmillVet.com...the site will know you are on a smartphone and take you to https://m.WindmillVet.com. Check out our award page! Thursday, March 21, 2013 - KTAB - Channel 32, Abilene . Dr. Price talks about Rattlesnake vaccine for your dogs, especially if you live in Rattlesnake Country! With Matt Torres on the live television show KTAB 4 U! Click here for more information about the benefits of Rattlesnake vaccination for your dogs. Thursday, February 28, 2013 - KTAB - Channel 32, Abilene . Dr. Price talks about the Therapuetic Laser (Cold Laser Therapy). With Matt Torres on the live television show KTAB 4 U! Click here for more information about this exciting new technology which provides so much pain relief and promotes healing. Thursday, January 24, 2013 - KTAB - Channel 32, Abilene . Dr. Price talks about the benefits of proper Pet Dental Care. With Matt Torres on the live television show KTAB 4 U! Thursday, December 27, 2012 - KTAB - Channel 32, Abilene . Dr. Price talks about the benefits of Micro-Chipping you pet. With Matt Torres on the live television show KTAB 4 U! Thursday, November 29, 2012 - KTAB - Channel 32, Abilene . Dr. Price gives some great tips on considerations BEFORE purchasing that Christmas Pet! With Matt Torres on the live television show KTAB 4 U! Windmill Animal Hospital brought him back to health. "Puppy" also tells Santa that the place smells good too! Santa decides that it DOES smell good! First aired November 23, 2012. Thursday, November 8, 2012 - KTAB - Channel 32, Abilene . Dr. Price gives some great tips on keeping your pets warm and safe when Old Man Winter brings some cold weather to Big Country. With Matt Torres on the live television show KTAB 4 U! Thursday, October 18 2012 - KTAB - Channel 32, Abilene . Dr. Price helps Pet Owners "Keep Their Pets Safe During This Upcoming Holiday Season". With Matt Torres on the live television show KTAB 4 U! Windmill Animal Hospital wishes Alex Hayes the very best with her new position in Kentucky....we will miss you Alex!...but also want to welcome to Abilene, Mr. Matt Torres! We look forward to working with you in helping Abilene's pets owners stay informed about the latest in veterinary medicine. Thursday, September 27 2012 - KTAB - Channel 32, Abilene . Dr. Price helps Pet Owners develop the judgement whether an issue requires home remedy, an office visit, or a trip to the emergency hospital. With Alex Hayes on the live television show KTAB 4 U! George has terrible breath - a green cloud every time he breathes! He frightens himself , then his mother with the awful smell, when she gives him breakfast. He even knocks out the other family dog! George visits Windmill Animal Hospital where they turn his tartar crusted teeth into clean pearly whites! George now has white sparkling breath that smells good too! First aired September 24, 2012. Thursday, September 13 2012 - KTAB - Channel 32, Abilene . Dr. Price speaks about the confirmed rabid skunk found in Abilene. Get your pets vaccinated! With Alex Hayes on the live television show KTAB 4 U! Thursday, August 23 2012 - KTAB - Channel 32, Abilene . Dr. Price speaks about skunks and "de-skunking your dog? With Alex Hayes on the live television show KTAB 4 U! Thursday, August 9 2012 - KTAB - Channel 32, Abilene . Dr. Price speaks about your pets and West Nile Virus and Canine Influenza. There is a great new vaccine available for Canine Influenza...does your dog need it? With Alex Hayes on the live television show KTAB 4 U - in their beautiful new studio!. Dr. Price visits with Alex Hayes about Canine Influenza on KTAB 4 U's new set! Thursday, July 19 2012 - KTAB - Channel 32, Abilene . Dr. Price speaks about getting your pets spayed and neutered. Its safe, is healthier for your pet, and will help alleviate the problem of over crowded shelters! With Alex Hayes on the live television show KTAB 4 U - in their beautiful new studio!. Thursday, July 5, 2012 - KTAB - Channel 32, Abilene . Dr. Price speaks about keeping your pets and home safe and free from Ticks and Fleas! 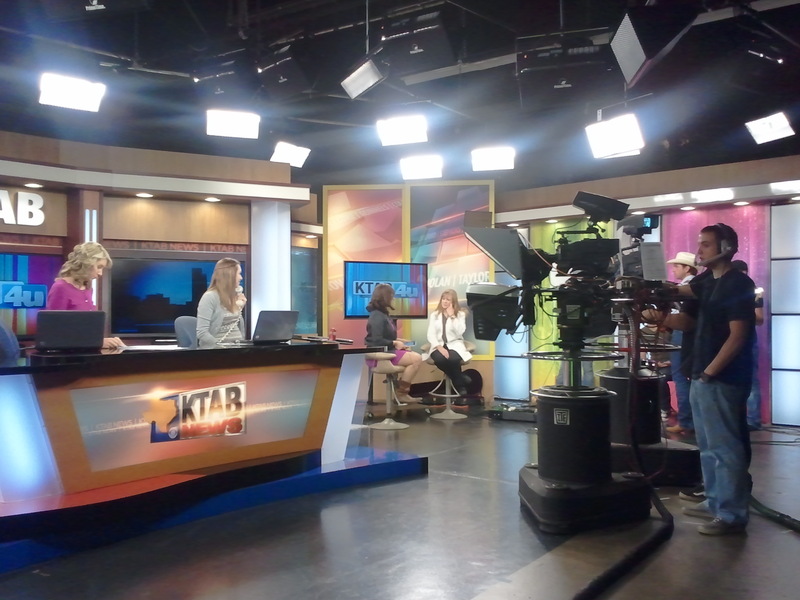 With Julia Hurt on the live television show KTAB 4 U.
Thursday, June 21, 2012 - KTAB - Channel 32, Abilene . Dr. Price speaks about keeping your pets cool, comfortable, and safe from heatstroke! With Alex Hayes on the live television show KTAB 4 U.
Thursday, June 7, 2012 - KTAB - Channel 32, Abilene . Dr. Price speaks about heartworm disease and prevention, with Alyssa Orange on the live television show KTAB 4 U.
Thursday, May 3, 2012 - KTAB - Channel 32, Abilene . Dr. Price speaks about pet allergies with Alex Hayes on the live television show KTAB 4 U.
Tuesday, March 27, 2012 - KTAB - Channel 32, Abilene . Dr. Price speaks about the importance and economics of Rattlesnake Vaccine for your dog. "And It Smells Good Too!" Our First Television Commercial - first aired March 22, 2012. Wednesday, November 23, 2011 . Dr. Price speaks about the Canine Parvovirus running rampant through the Abilene area. Thursday, September 15, 2011. Dr Price's husband, Dale speaks on camera about the City of Abilene Building Department changing the rules AFTER a building permit is issued! Click here to read the Channel 9 KRBC story and see the video. The Rest of the Story (as told by Dale): Before a building permit is issued, the Building Department reviews all plans (site plan, building plan, engineering, etc.). It is done this way because it is much more economical to change plans than to make changes after construction starts! We submitted our Site Plan, which was prepared and stamped by a Licensed Texas Professional Engineer. We submitted our building plans, which were prepared by a Licensed Texas Architect, and we submitted our foundation plan, which was also prepared by a Licensed Texas Professional Engineer. The City reviewed these plans for 3 weeks. the City then issued a building permit along with a letter listing 7 additional requirements to the plans. Six of the requirements were items such as we must get a separate permit for a sign, and we must use a licensed, bonded general contractor. Item 4 was that the International Building Code (IBC) required the area around each water closet (toilet), from the floor to 48" high, you must use a smooth, non-absorbent surface. They asked us to respond to these 7 items in writing. I consulted with my architect, and we composed a letter addressing each of the 7 points, including that we would address point 4 with Expoxy wall paint, over wall board (smooth and non-absorbent). We told them that if this did not meet their interpretation of IBC requirements, please notify us and we can discuss options. We received no response from the City. The first issue arose during one of the inspections (long after the concrete slab was poured and the concrete crew has left). The inspector said he wanted me to add a 5 foot square porch outside our "Isolation Ward" exterior door. This porch was NOT on the approved site-plan. This is a ward with an exterior door that will ONLY be used to bring in a contagious patient, so that the remaining portion of the hospital is not contaminated for our other patients. We did not want it to LOOK like an entrance. However the inspector told us the concrete would HAVE to be installed, even though it wasn't on the approved plans. The City could have asked for this during the permitting and review stage so that we could have had the concrete crew pour this pad while they were pouring the foundation, sidewalks and parking lot. Instead I had to pay the concrete crew to come out for this very samll project. The second issue started when we were told we would have to have a engineer design the steel Lintel supporting the brick above the roof (on the gable) on the front of the building. Now, all brick masons know you have to use steel to support the weight of the brick above the roof. We had to stop construction, send the brick crew home for a week (that was cheap!) and pay a Licensed Texas Professional Engineer to design and stamp the EXACT same design that our brick masons were going to use. The City could have asked for this during the permitting and review stage so that we could have budgeted money for the extra engineering charges. Again, once the building permit is issued, you should be able to build to the plans without problem! The third item was when we wanted to put up our windmill (just like thousands of windmills throughout the Big Country). Well, the City said they required a building permit, and the foundation would have to be engineered and stamped! My plan had been to put 1 cubic yard of concrete under each leg of the windmill. However, I paid a Licensed Texas Professional Engineer to design the foundation...and he came up with 4 holes 24" diameter by 66" deep - low and behold; about 1 cubic yard of concrete under each leg. However, when the City Inspector came out to approve the holes before concrete was poured, he got no closer than 10 feet from the closest hole, then said "you're cleared to pour", then turned and walked away. He never measured the diameter or the depth of any of the holes. Why require engineering and inspection if you aren't even going to check for compliance? The final straw was during the FINAL inspection. The inspector looked at each of our bathrooms, and promptly said our epoxy paint over wallboard would not pass his requirements. I told him we had addressed this in a letter to the City the previous April, when the building permit was issued. He said he didn't know what kind of deals I had made, and with whom. But he was the inspector, and this would not pass! I then requested we contact the plan reviewer and the building department management to discuss this. This is when Big Country News (Channel 9 - Abilene) got involved. We had a meeting with the top two people in the Abilene Building Department. I was told by the manager that he would look into the issue and would respond before the end of the day. The meeting adjourned. The reporter then called the manager and informed him of the news story. I was immediately called by the manager and told "the epoxy paint would be just fine". Believe me, there is no one more interested in a well built building then me...I am the one with all the "skin in the game". However the City's continual additional requirements not only delayed our opening but costs us several thousand dollars in expense. This is money that we will never recover....the stamped Lintel drawings and the stamped windmill drawings don't add value to the place, just expense. This money could have been used to buy additional equipent to treat our patients! We built our last practice in Flower Mound, Texas in 1997. In fact it is the same building except for the roof-line. Flower Mound is very difficult to build in because of their vision of being a very upscale community. They were indeed tough during the planning stages (in fact, they wanted us to add a fake chimney on the gable facing the parking lot, simply for appearances). However, once the building permit was issued, they were wonderful to work with. We worked together to build a strong, safe building, just as the plans were when the building permit was issued . It is a shame that Abilene's growth has been hurt because our building department has made new commercial construction so expensive. They have taken the attitude that they can miss several items during the plan review stage, and issue the building permit, thinking that any missed requirements will be picked up by the inspectors, and the owner will pick up the tab for these oversights. The problem is, owners make their construction budget based on the plans in place at the time the building permit is issued, not as you go along! This practice needs to be changed immediately before the Abilene Building Department drives away all future commercial growth in our area. 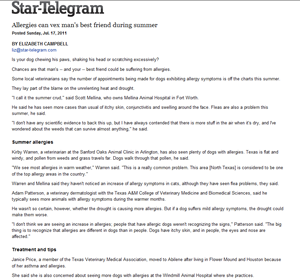 Sunday July 17, 2011 - The Ft. Worth Star Telegram published a story about increased pet allergy symptoms during the long hot summer. Dr. Price is well known for her thorough management of allergies and skin diseases. 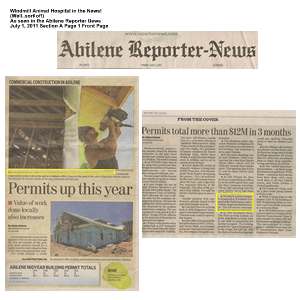 Friday July 1, 2011 - The Abilene Reporter News published a commercial construction story.